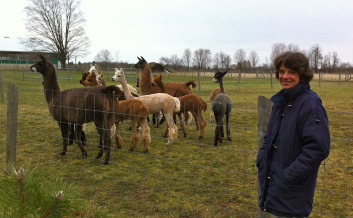 Freelton Fibre Mill is located in West Flamborough between Hamilton and Guelph with its owner Ute Zell. Ute has over 40 years of knowledge in hand spinning and utilizes the excellent mini mill machinery, which is very multifunctional. This combination is capable of producing specialty yarn that you never would have dreamed of. The Mini Mill is specially designed for production of smaller volumes. The smaller volumes allow us to personalize each fleece to your desire. In other words customers will know exactly which animal produced which yarn, this can be very important to know for breeding. To be able to produce top quality yarn, we only process skirted fleece. The cleaner the fleece, the better the results. We are unable to spin fibre that is longer than 6" stretched. We also accept pre-washed fleeces, which then get washed in a shorter cycle. We recently added a fibre separator or de-hairer to our processing, to let us separate the guard hair from the softer undercoat. This results in the highest quality fibre.